toward provision of the real satisfaction. 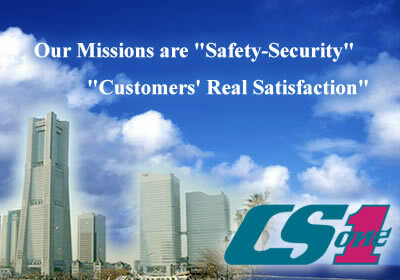 CS ONE CO.,LTD. operates a business in mainly Fire and Intrusion Protection including designing, installation, inspection, and maintenance for both domestic commercial and U.S. Military Bases in Japan. We are confidence to provide a high quality safety with reasonable cost and well trained with the latest technics. Single-source responsibility is the CS ONE way of doing business. We offer a complete range of services by qualified, thoroughly experienced people, knowledgable and dedicated people are the CS ONE's difference. You can reach us by the DUNS NO. 706987229 and NCAGE CODE:SY727 for more information. We are looking forward to receiving your enquiry soon. Copyright(c) 2005-2009 CS1 Co.,Ltd. All rights reserved.